Depression can happen at any time, but occurs more often during holidays and colder weather. Seasonal Affective Disorder (SAD) is a cyclical form of depression that occurs only during a specific time of year, which is usually the winter. Signs may begin in the fall after daylight savings time occurs. The exact cause of SAD is unknown, but mental health professionals attribute the condition to changes in body temperature, hormone fluctuations, and the lack of sunlight as the seasons change from fall to winter. Researchers believe that having fewer hours of daylight upsets the body’s circadian rhythm. This in turn imbalances the brain chemical serotonin, which impacts mood, and melatonin, which impacts sleeping patterns. 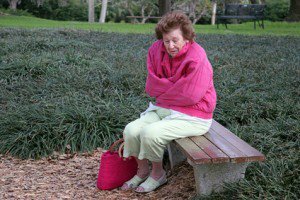 SAD can occur at any age, but it can be particularly prevalent in the elderly, especially those who are homebound or suffer from chronic conditions aggravated by cold weather. If you have an older loved one who seems to be withdrawing socially, lethargic, sleepier than usual during the day, losing interest in their usual activities, and/or is gaining weight due to a sudden increase in appetite, they may be experiencing SAD. Empty nest syndrome symptoms can be similar to SAD so if you suspect a loved one is experiencing SAD, it is important to schedule an appointment with a medical professional to confirm the diagnoses. It is possible they may prescribe a course of anti-depressants to help get them through the season. There are also some adjustments you can make to your loved one’s home or routine that have the potential to improve their mood. Depending on the individual’s physical limitations and the weather, it is good for them to be outside during the day to enjoy the sunlight when it is safe and possible. Take a look at your loved one’s home and make sure they are letting in natural light wherever possible. Encourage them to open their curtains and blinds, and ask if they would like their bed moved closer to a window. Add some colorful indoor plants to their home if feasible. Consider purchasing a light box, which is an object that emits ultraviolet rays similar to that of natural sunlight. Research has shown that using such a box for just 30-45 minutes a day can help adjust the chemical imbalances that cause SAD. Physical exercise helps to combat the effects of depression. Try to help your loved one find an exercise activity that is safe for them. For example, many indoor shopping malls have walking groups, and your local YMCA may offer low impact water aerobics classes. Make sure your loved one is eating a balanced diet, as vitamin deficiencies can contribute to SAD symptoms.